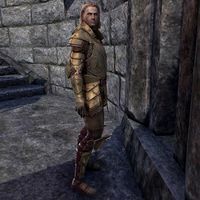 King Ranser was the Breton ruler of Shornhelm when High King Emeric was elected as the leader of the Daggerfall Covenant. When Emeric married Maraya instead of his daughter, Princess Rayelle, he announced war against him. After multiple defeats, he was cornered at the ruins nown known as the Traitor's Tor by an army of Orcs lead by Kurog gro-Orsinium. He later died at the hands of his trusted military advisor, General Dathieu, when he realized that Ranser was going insane. This page was last modified on 4 October 2015, at 00:29.